Historical low mortgage rates mean RECORD HIGH penalties for BIG SIX BANK clients! Mortgage penalty calculations continue to mystify Canadian consumers. For years, I’ve posted numerous articles on penalties… how they affect us… how they are calculated…..why you need to understand them.. and most importantly, HOW TO AVOID THEM!! I’ve shared dozens of horror stories about average Canadians being hit with mortgage penalties of $12,000, $15,000, $20,000, $30,000 and more. These examples aren’t from some obscure small financial institution. It’s your BIG SIX BANK. Yet, the attitude from Consumers is that it won’t or doesn’t affect them….until it’s too late. I’ve also shared the solution on how to avoid this… and I’m going to share that with you once again.. If you want to know how to avoid monster penalties, then take a few minutes and read this.. It could save you untold $$thousands…. 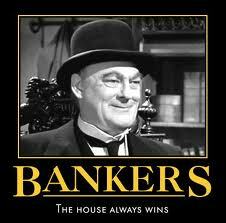 Like Mr. Potter says, “the house always wins.” The Banks keep finding ingenious ways to maximize their profits. Like this past January, when the BANKS didn’t pass along the 0.25% rate cut from the Bank of Canada. Instead, they only cut it by 0.15%. They gave us bunch of reasons, but none of them made sense. It was cash grab, plain and simple. THE HOUSE ALWAYS WINS… ESPECIALLY WITH INFLATED PENALTIES!! Oh, and in case you are thinking you won’t pay the mortgage early, or sell your house, or refinance… Think again. The average Canadian mortgage borrower changes their mortgage every 3 years! There’s a lot reasons why Canadians change, but that’s a discussion for another day…. for now, let’s trust the stats..
Here’s one experience with TD BANK.. (not picking on TD, as all the BIG SIX use a similar calculation). Remember, this is a typical situation.. Happens every day.. The mortgage was originally funded April 18, 2012 for $410,000. This borrower took a 5 yr fixed rate at 3.49%. That was a 1.95% rate discount (a fair offer at the time, but not as good as what I was getting back then). The current balance is $360,000. They are selling the home, buying a larger one, and need to increase to $580,000. They could port this mortgage, increase it, and blend the rate.. but they want to lock in for 5 yrs again, especially with rates at historical lows. I agreed with their decision, but unfortunately, it wasn’t gonna happen. They soon discovered their penalty would be enormous. The penalty to exit is $18,000!!!! Put another way, that penalty is equal to 17 months of interest! Remember, they only have 24 months remaining in their term! If this doesn’t scare you, then I don’t know what will! Please read on, there is a good alternative…. HOW DO MORTGAGE PENALTIES WORK? The BANK and all other Mortgage Lenders can charge either a 3 month interest penalty, OR, an Interest Rate Differential (IRD) to exit your mortgage, whichever is GREATER. AND HERE’S where the difference is…. MANY OTHER LENDERS DON’T INCLUDE YOUR RATE DISCOUNT AS PART OF THE CALCULATION!!!! The BIG SIX BANKS do! That’s the key! TD takes this borrower’s rate of 3.49% and subtracts is from today’s current 2 yr POSTED fixed rate 2.84% (2 yrs is how long they have remaining on their mortgage). AND they subtract the RATE DISCOUNT you were given at the time of the mortgage 1.95%. That’s 3.49% less 2.84% = 0.65% (THIS IS WHAT THE PENALTY SHOULD BE).. but TD also adds in the 1.95% rate discount… (how and why? this is a mystery to all of us…yet the BIG SIX BANKS have done it for 15 yrs and they keep doing it). WHY IS THE PENALTY SO HIGH? TD, like the other BIG SIX BANKS make you pay for the benefit of your rate discount for the entire term… regardless of whether you use it or not. I’ve used this example before to summarize. It’s like joining a gym that retails for $100/mth but they give it to you for $40/mth. You sign a 5 yr contract…. 3 years from now, you have to move and want to cancel the gym membership. Should the gym make you pay for the discount for the remaining 2 years and collect $1440?. Is that fair? Does that make any sense? Of course not. But the BANKS think it is… and they’ve been getting away with it. Here’s another hidden secret they don’t want you to know…. Take a look at the rate discounts for shorter terms… they get smaller the short the term.. (is this by coincidence, or by design?) . In the example above, the TD Bank had a 2 yr posted rate of 3.55% and a wholesale broker discounted rate of 3.25%. That was just a 0.30% discount. Today, that posted 2 yr fixed is 2.84% and the wholesale broker rate is 2.24%. That’s a 0.60% discount. How can the TD use a rate a discount of 1.95% to calculate their penalties? No one can logically answer…. Here’s a link to the BANKS online penalty calculators. HOW CAN WE AVOID THESE OUTRAGEOUS PENALTIES?? Obviously, this client was sc%*#d, I mean stuck! Forgive me, there are a lot of other words that come to mind. Had these clients found me earlier, we would have gone to a better lender, with better options, and a FAIR prepayment penalty… The cost to exit would have only been $5821 (that’s under 6 mths interest… Not bad compared with 17 months interest and a staggering $18,000 rip off!!). And their rate would have been 3.39%! Avoiding these outrageous penalties is easy. Go with Lenders that are competitive, have good options, privileges, and also carry FAIR PREPAYMENT PENALTY CALCULATIONS! Don’t know where to look? You’re not alone. Call an experienced Mortgage Broker for unbiased advise and access to 40 or 50 Lenders.. Previous Previous post: $22,500 savings by breaking mortgage and getting into today’s low rates! Next Next post: News Flash! BMO and TD’s 2.79% is great but it ISN’T the lowest rate! CanadaMortgageNews.ca Historical low mortgage rates mean RECORD HIGH penalties for BIG SIX BANK clients!